The above chart on SPECsfs(R) 2008 results was discussed in our latest performance dispatch that went out to SCI’s newsletter subscribers last month. 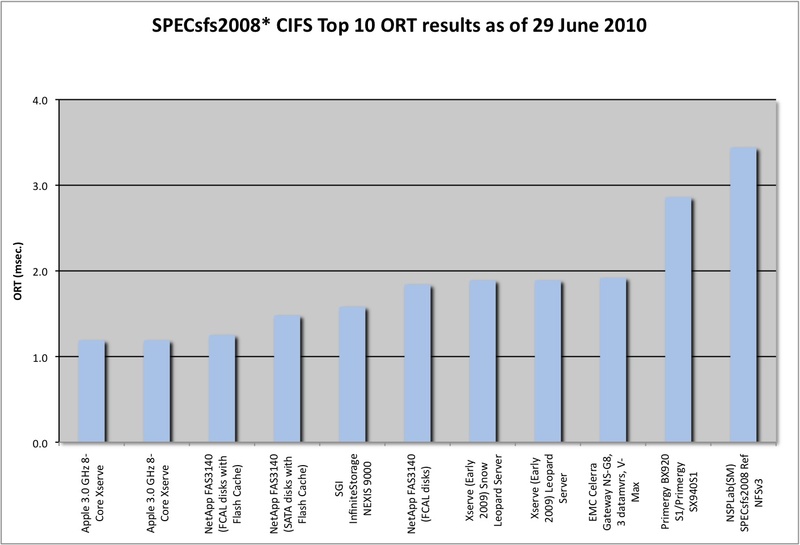 We have described Apple’s great CIFS ORT performance in previous newsletters but here I would like to talk about NetApp’s CIFS ORT results. If I had to guess the point of this exercise was to show that one can offset fast performing hard disk drives by using FlashCache and significantly less (~1/4) fast disk drives or by using Flash Cache and somewhat more SATA drives. In another chart from our newsletter one could see that all three systems resulted in very similar CIFS throughput results (CIFS Ops/Sec. ), but in CIFS ORT (see above), the differences between the 3 systems are much more pronounced. Why does Flash help CIFS ORT? As one can see, the best CIFS ORT performance of the three came from the FAS3140 with FCAL disks and Flash Cache which managed a response time of ~1.25 msec. The next best performer was the FAS3140 with SATA disks and Flash Cache with a CIFS ORT of just under ~1.48 msec. The relatively worst performer of the bunch was the FAS3140 with only FCAL disks which came in at ~1.84 msec. CIFS ORT. So why the different ORT performance? Mostly the better performance is due to the increased cache available in the Flash Cache systems. If one were to look at the SPECsfs 2008 workload one would find that less than 30% is read and write data activity and the rest is what one might call meta-data requests (query path info @21.5%, query file info @12.9%, create = close @9.7%, etc.). While read data may not be very cache friendly, most of the meta-data and all the write activity are cache friendly. Meta-data activity is more cache friendly primarily because it’s relatively small in size and any write data goes to cache before being destaged to disk. As such, this more cache friendly workload generates on average, better response times when one has larger amounts of cache. For proof one need look no further than the relative ORT performance of the FAS3140 with SATA and Flash vs. the FAS3140 with just FCAL disks. The Flash Cache/SATA drive system had ~25% better ORT results than the FCAL only system even with significantly slower and much fewer disk drives. The full SPECsfs 2008 performance report will go up on SCI’s website later this month in our dispatches directory. However, if you are interested in receiving this report now and future copies when published, just subscribe by email to our free newsletter and we will email the report to you now.